I’ve been a fan of this band for awhile. Anna Maria and I have both reviewed a few of their records in the past. They even made it onto my best of 2006 list. Their music makes me feel like I’m sitting in a darkish apartment in London on a rainy day. I’ve never been in a London apartment on a rainy day or any other. Or even to London for that matter. Maybe I’ve seen too many movies. But whatever. I like it. This happened before, I’m afraid to pick out stand out songs because they’re honestly all good and similar. So I’m just going to say that I’m glad I’ve got a new batch of awesome songs from this band and I hope you’ll like it too. In my notes, I see that I Wish I Never Saw the Sunshine reminded me of the Cowboy Junkies. As I was writing this review I went back to re-read past ones and on their first record in 2003, I see that they reminded Anna Maria of the Cowboy Junkies then as well. I also thought they had a little Mazzy Star as well as Belle & Sebastian. 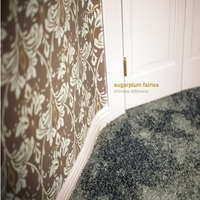 So if you like any of those bands, it’s a good bet you’ll like Sugarplum Fairies if you aren’t already a fan. They are still good I’ll bet.